A very popular and traditional Indian dessert that is served on festivals- Halvah, which means sweet in arabic. Gajar halva is typically made with sautéing fresh carrots in ghee and cream, however this dessert is made with vegan butter and coconut milk, reducing the calories and making it dairy free. Carrots are naturally sweet and have been used for thousands of years along the Silk Route, as a sweetener is desserts in lieu of sugar. 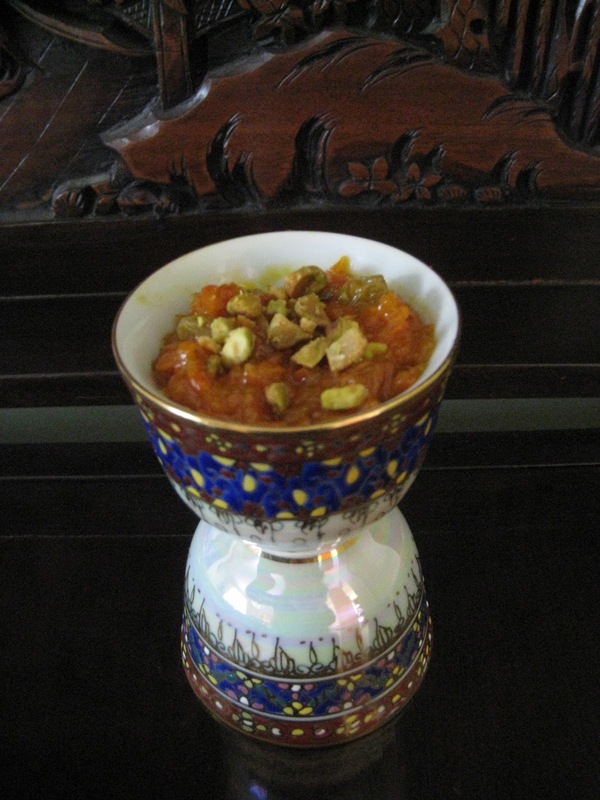 This halva is adorned with chopped pistachios and jeweled raisins with just a hint of cardamom. A little of this densely decadent pudding goes a long way, since it is so rich and flavorful. Can be served warm or cold with a dollop of ice cream after a spicy meal. 1 Melt butter in a skillet and then add carrots. Reduce heat to medium low and coat carrots in butter. 2 Stir in the coconut milk and simmer uncovered on low heat for 45 minutes; stirring occasionally. 3 Stir in the brown sugar, raisins, cardamom, and salt. Stir constantly until all the sugar is dissolved into a pudding like consistency; about 15 minutes. 4 Wait until slightly cool to transfer to small dessert bowls. Store in the fridge and when ready to serve, invert onto a dessert plate and garnish with pistachios. With winter upon us, it’s easy to picture oneself on a tropical island, under the shade of a coconut palm. But even if the mercury does eventually head north, a taste of the tropics remains as close as these bite size banana coconut muffins laced with Chinese 5 Spice. Quick to throw together and under 30 minutes to bake, these individually sized muffins will dreamily take you to the sunny isles. It might seem like an odd combination, but actually- banana, coconut and Chinese 5 Spice all originate from the Southeastern part of Asia. Marrying them together into these intoxicatingly sweet and nutty morsels made sense. In Sanskrit (ancient Hindu language), the coconut is viewed as the kalpa vriksha (“the tree which provides all the necessities of life”). Virtually every part of the coconut palm can be utilized in some manner. Such is the case with these muffins- the coconut milk is used in place of regular milk; coconut oil for baking; and the white coconut meat is used as a confection. It’s wonderful when you can create something that utilizes all parts of a plant, and nothing goes to waste. Chinese 5 Spice was originally used to make perfumes, but now is used in avant garde savory desserts. The formula is based on the Chinese philosophy of balancing the yin and yang in foods. The most common combination in 5 Spice is bajiao (star anise), cloves, cinnamon, huajiao (Sichuan pepper) and ground fennel seeds. To finish off the muffins I sprinkled them with coconut flakes, because I love the crunchy texture it gives to baked goods. The coconut flavor permeated the entire muffin and gave a subtle sweet note that you don’t normally find in a banana muffin, while the 5 spice gave them a warmth, and the bananas themselves allowed the muffins to be nice and moist. Put oven rack in middle position and preheat oven to 350ºF. Line 14 muffin tins with paper liners. Whisk together flour, shredded coconut, spices, baking powder, salt, and baking soda in a bowl. Whisk together coconut oil and sugar until well combined, then whisk in vanilla, eggs and then bananas until well blended. Whisk in coconut milk and lime juice, then the flour until just combined. Drop batter into prepared muffin pan until each has an equal amount, and sprinkle with coconut flakes. Bake muffins until a wooden pick or skewer inserted in center comes out clean, and they are lightly brown about 20-25 minutes. Cool on wire racks. Cherry and almond are one of those made-in-heaven combinations that you can truly never go wrong with. I made sure to source some really good quality organic dried cherries (Trader Joe’s) for these cookies. I tend to think that, the quality of your dried fruit and nuts can make or break your sweet delights. weet, sassy, nutty, and rich with love hugs and kisses cookies. 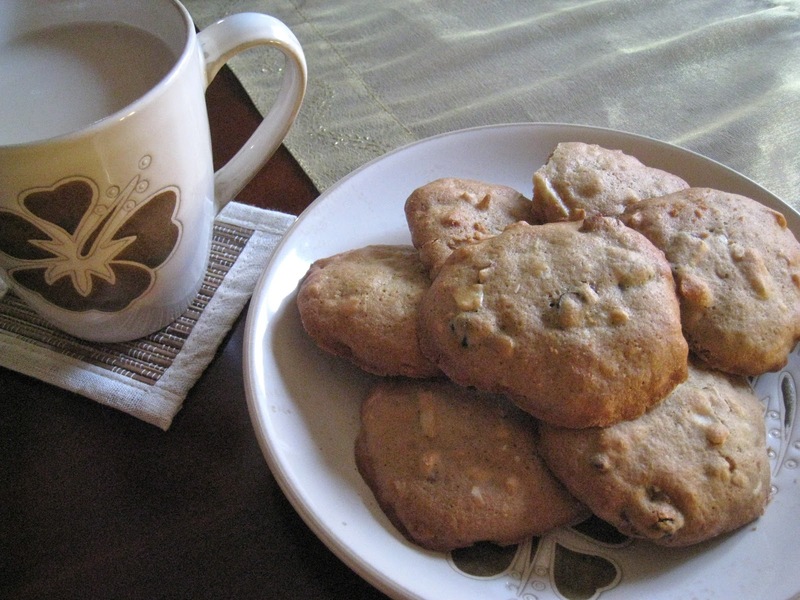 This recipe has been inspired from Vegan Cookies Invade Your Cookie Jar…. Preheat oven 350F degrees. Line two baking sheets with parchment paper. In a large bowl, whisk together sugar, oil, vanilla extract, almond extract and lemon zest. Sift in flours, shredded coconut, baking soda, and salt and mix. When ingredients are mostly combined, add almonds and cherries and mix until thoroughly combined. Drop cookies by generous tablespoons onto baking sheets–about 2 inches apart. Bake for 10 – 12 minutes until edges begin to brown. This is not one of those multi layered frosted cakes… I don’t have the patience to make a day of baking a cake. I know that when it comes to chocolate cake, many people would disagree with that since most of the fun in baking a chocolate cake is tasting and licking away the batter and frosting. That would send me into a serious sugar high. No, this cake is not a whole day affair, but the taste is like it came from a gourmet patisserie. This chocolate cake, is a moist, chocolaty no fuss cake that is soft, fluffy and GLUTEN FREE. You could also make it vegan with an egg replacer, but I did use two eggs for this cake. You will have to refrigerate the batter for at least 30 minutes before baking to improve its texture. When baked, you can store this cake in the fridge, as it keeps well, however I like to warm it up before I eat into it again. As a cold cake it takes on more of a truffle texture, warming it up brings it back to a moist and bouncy cake. Adapted from Heidi Swanson’s Basic Chocolate Cake recipe. Grease an 8×8 square cake pan. Sift the flours, cocoa powder, baking powder, and salt into a large bowl. In a separate medium bowl whisk together the melted butter and maple syrup until it looks like caramel. Whisk in the eggs, vanilla, and then the coconut milk. Pour the maple syrup mixture over the flour mixture and stir until barely combined. Add the chocolate and stir until everything comes together and is no longer dusty looking – avoid over-mixing. Refrigerate batter for up to 30 minutes, but no longer than 2 hours. Preheat oven to 325F degrees with a rack in the middle. Pour the batter into the prepared baking pan and bake in preheated oven for 30 – 40 minutes. This is the most amazing and simple fool- proof cake that never fails. You can use lemons instead, but make sure it has the same weight as the oranges. A little note about this cake, you have to like the flavor of marmalade, since this has a tinge of bitterness to it because it’s made with the pith and rind. That is why I added as an option bittersweet chocolate chips to add in the batter for more sweetness, if you prefer, however I like it the way that it is. If trying this out, please leave your comments. Especially delightful when served with vanilla ice cream, yoghurt or crème fraiche. 1 Bring a pot of water to boil, add the oranges, cover and simmer for 1 hour. 2 Strain off the water, and let the oranges cool. 3 In the meantime, food process the sugar and soymilk until dissolved and pour into large bowl. 4 When oranges are cool. Cut in half and de-seed them and put the oranges with peel and pith into the food processor until reasonably smooth. 5 Pour the pulp into the sugar and soymilk mixture. Then add the almond meal, baking powder and chocolate chips (optional) gently mix together. 6 Spray cooking spray into 9X11 baking dish. Bake at 375F for 1 hour. 7 Leave the cake to stand for 10 minutes, then turn it out on a cooling rack and allow cooling for an hour.